Mr. Javier Lambán visits NUREL on the occasion of our 50th anniversary. The President of Regional Government of Aragón, Mr. Javier Lambán, together with the Counsellor of Industry of Aragón, Ms. Marta Gastón, visited last Tuesday, September the 30th our facilities in Zaragoza on the occasion of the 50th anniversary of NUREL. After a first meeting with the management of the company, Aragón Government President and his team, were able to make a visit through the main production sections of our plant, knowing the processes and products and establishing contact with employees who were working at the time. Mr. Lambán highlighted the Aragonese origin of the production and described it as "exemplary from every point of view". 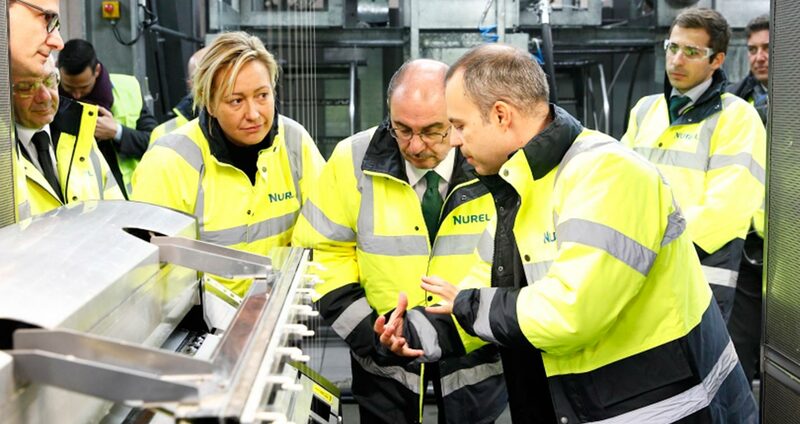 He underlined NUREL's policy regarding sustainability with the environment, circular economy, R&D, management excellence and, above all, our commitment with local community, emphasizing the internationalization and the export of our production.